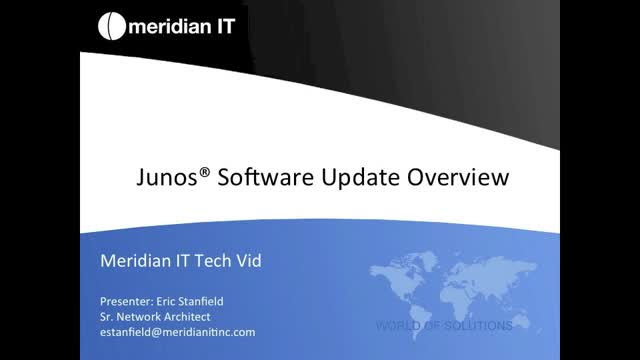 A brief video that walks through the process of performing a software update on a Juniper device running Junos. Achieve these strategic goals with simplicity and scalability backed by a foundation of next generation blades and an unsurpassed network. Building the conversation roadmap with executives is one of keys to success. 1. How an Integrated Datacenter with blazing-fast virtualized workloads can enable you to address what is top-of-mind for your organization’s leadership. 3. How Converged Data Center solutions provide less moving parts which will streamline administration and operational efficiency. Listen to Darryl Hamel of Meridian IT, Patrick Callanan of Juniper Networks, and Scott Unger of InfoBlox talk about their winning partnership. Hear about how Meridian can bring together multiple technologies in a seamless fashion, allowing corporations to leverage best of breed technologies. Listen to Darryl Hamel of Meridian IT and Patrick Callanan of Juniper Networks talk about a strategic partnership. Hear about the keys to a successful partnership! An informal tech session covering the basics of the Junos operating system. Attend impactful live and on-demand seminars. Leave with insights and tactical advice that will have an impact on your network infrastructure.